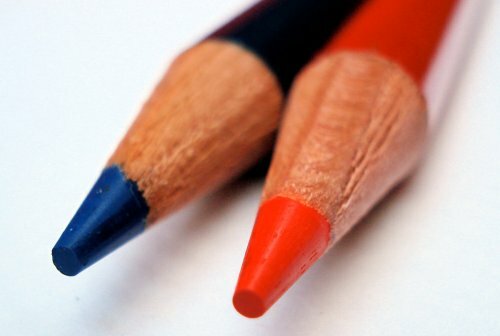 At pencil talk, we love red and blue pencils! But sometimes one needs a red pencil or a blue pencil – not both at once. Or, you’ve found that a double ended pencil gets unusable a bit too quickly. Here is a red/blue pair of very impressive pencils. Hailing from the venerable Mitsubishi Pencil Co., we have Vermilion (model 2451) and Prussian Blue (model 2453) pencils, both round with ferrule and eraser, and the finish matching the lead colour. Though not shown in the photos, the pencils (labelled “Hard”) can be reliably sharpened to extremely fine points, even in the most acute setting of a Carl DE-100 sharpener. This is an exceptional achievement for colour pencils, which are often brittle and sharpener-unfriendly. Further, they answer a question I’ve often heard – is there a colour pencil that can be used as a writing pencil? 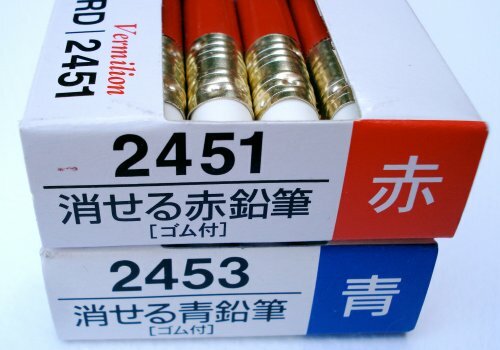 They sport a feature highly untypical of Japanese pencils – a ferrule and eraser. The attached eraser seems to be depleted by 20% or so after a single use. On Maruman Mnemosyne paper, the erasure is okay but not exceptional. But on Rhodia paper with a Tombow Mono eraser, there was an extremely clean erasure. These pencils seems very capable at many tasks – they are non-breaking writing or checking colour pencils that are also erasable. Yet another product that keeps Mitsubishi at the top of their industry. I wonder how resistant to light these colours are. As Dave from “Dave Mechanical Pencils” has pointed out the erasable colours fade very quickly when exposed to sunlight. Gunther, thank you, that is an excellent point. Now I am also curious. Gunther, i too am curious on the subject you mentioned. I’m looking for double-ended, red/blue mechanical pencils. Are they available? Living in Paris, I phoned Mitsubishi in Paris. They don’t sell these pencils. I’m looking for a box of 2451 and a box of 2453. Please let me know if I can order it somewhere on the Internet!